When you gave your life to Christ, He gave you a new heart, a regenerate heart. He turned your heart of stone into a heart of flesh. He showed you how to stop living for yourself and start serving others. There is no doubt that you have some people you love that are headed for hell. I know I do. With this in mind, we should pray daily for them, that Christ would draw them out of the muck and mire and set their feet on a solid foundation in Himself. 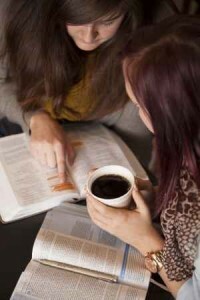 For the ones that are receptive to your faith, you can do some serious seed planting by showing them verses from the Bible to help them make the decision to follow Christ. All those that are lost have a condition. It is a condition of the heart and mind. It is called sin. They are currently a slave to it, obeying all of its desires. They don’t realize that they are on the fast track to hell. You see, anyone who is a slave to sin doesn’t understand their predicament. That is why they boast in themselves and are not ashamed. Their end is in death, eternal death. Satan is the best in his field. He can deceive anyone, and he does every single day. He tempts people in every way possible to sin against God. Those that you are witnessing to need to realize that Satan is real and that they are merely bait in his traps. Right now your lost friends/loved ones are sons and daughters of Satan. They have become his children because they have believed his lies and evil schemes. They have been deceived. 2 Corinthians 11:14 describes him as an angel of light. It’s no wonder that his children follow him. Satan is excited for every sinner’s arrival into hell. The lost need to understand who Satan is and how he desperately wants them to die without knowing Jesus. Related reading: If God is love, what is Satan? When leading someone to Christ, you need to convey their need for Christ. The lost need to know that their sin put Jesus on the cross. This is love in the highest degree! That is why we serve such an awesome Savior! He died in advance to pay for our sins! But still, it is our sin that put Jesus on the cross. There is no way we could have done anything to regain our freedom in God on our own. This is why Jesus died for us. Only a perfect, spotless sacrifice would be acceptable to God. How do we know that Jesus was and still is perfect? Without His death we would all most certainly still be facing God’s wrath. Those who are lost need to understand that Jesus’ death, burial and resurrection was necessary for their salvation. This must also be coupled with the belief that this (Jesus’ death, burial and resurrection) is the only possible way we will be in heaven when we die. The lost need to understand that any faith that teaches contrary to Christ is a lie: Mormonism, Buddhist, Islam, Jehovah’s Witness, and others have led many astray. Jesus is the only way! Related reading: Is Jesus The Only Way? Many questions arise as to what happens when conversion happens. Three main things occur: salvation is given, a regenerate heart is formed, and the sealing of the Holy Spirit occurs. I just covered salvation in the “Jesus Saves” section above. A regenerate heart (spiritual cleansing) is given by God who has drawn us to Himself through Jesus! Lastly, we are sealed with the Holy Spirit at conversion. When leading someone to Christ, you need to convey their need for Christ. The lost are in sin and are children of the devil. Jesus is the only way to salvation! I pray that if you have not accepted Jesus that you will not delay! Eternity is forever, and heaven and hell are very real places! For those that know and love Jesus, may God bless you as you live a life worthy of the calling! Related Reading: What Is The Romans Road To Salvation? Americans are comfortable. We basically have a “chicken in every pot”, and even those in poverty have more wealth than 85% of the rest of the world. Many in my circles have need of nothing materially or physically or emotionally. They have great incomes, great families and great health. They are in their opinion… “living large”. Why in my world would they want an intrusion into their “perfect” world with this Jesus you mention? Sundays are “sleep in” days, and many donate to charitable organizations like SSASM …Society for Saving the Amazon Spotted Moth. Who cares about Christian relief? There are too many mouths to feed already, in their opinion. Many lead exemplary moral lives and put me to shame with their cool handedness when calamity strikes. The one thing they do lack is an awareness of their lost condition. A lack of knowledge that they are headed to an eternity in hell unless they are made aware and acknowledge their sin and trust the Son of God as their deliverance from this place of torment. So after salvation we have this Law written on our hearts and it is encapsulated in one word, “Love”. Jesus said to love the Lord with all your mind, soul and strength…and to love your neighbor as yourself…all the Law and the prophets hang on these two commandments. So after salvation we have God’s Law written on our hearts. I believe the unbeliever needs to be made aware of the Law(Ten Commandments). They need to be “woken up”… reminded, that God actually wrote these Laws on their conscience and that no one (especially me) has ever been able to keep this Law. We have all been Law breakers(Rom 3:23). We need to show them lovingly that the penalty for breaking these laws is death or hell(Rom 6:23). This step I think is crucial. Unless they understand their destination they won’t want the remedy. Who wants a shot of Penicillin when they think they are well? Telling them about heaven before hell, I think is a mistake. This whole common church methodology about ‘God having a wonderful plan’ for your life, we see in so many Christian circles, is ineffective in these cases…they already have a wonderful life according to themselves. Once these folks are made aware of their destination from being a Law breaker(…hell…torment…flames…worms…forever…have to say it….I know…we will be criticized by Christians who want a softer Gospel. I have been yelled at by local pastors…so be it), only then by God’s mercy and Grace will they begin to realize that maybe they should find out how to avoid such a place. Enter Jesus! Now, we can present the only rescue from hell. The Sinless One, who paid the penalty for our transgression…our Lawlessness. Jesus became our bail bondsman. So that turning away from their sin(repentance) and belief in Him, as our surety(Jn 3:16), taking our place by His death and Resurrection…rescuing us from the torments of hell…is our only hope of heaven. By God’s Grace they will then want the shot, but, IMO, not before they understand their sickness(destination). Thank you Derek, for the great reminder of how we must continue to reach the lost, who, without Jesus, are all going to end up in fire and torment for all eternity. Thank you also to Jack, for letting me vent on a topic very near and dear to my heart. Thank you for that comment DocReits! I agree with you on pretty much all of it. The only thing I would like to mention is that being in hell for eternity is bad and horrible, but even more so is being separated from God eternally. In hell no one will ever feel the presence of God again. We see and feel Him in nature (luscious landscapes, the breeze blowing through your hair or lack there of in my case LOL!, the change of the seasons). He does things for us daily that we may never even know. All of this will pass in hell. No longer will you feel Him. You will be bound to eternal death chains that cannot be broken and all who are there will cry out to God and they will call Him Lord (Romans 14:11) but it will be in vain. God will not listen at that point and they will be terrified at the judgment that is upon them. To be separated from God forever is the ultimate punishment. Thank you again for such wisdom and reflection. God bless! God Bless you Derek and thank you for replying to my post. I agree with everything you wrote. I respectfully disagree with you on application. The topic of your post was “Bible Verses to Lead Someone to Christ”. Those unbelievers in my sphere of influence are not going to be persuaded, IMO, by speaking to them about their “lostness” or missing out on the presence of God for eternity. Respectfully, they do not want or need a relationship with any god, in their opinion. Their god(material possessions) is just fine for them. Granted, once saved, we understand the blessedness of relationship with God, but before salvation my colleagues couldn’t care less about this…so why believe, when no need? “And as he reasoned of righteousness, temperance, and judgement to come, Felix trembled”(Acts 24:25), they will take note and hopefully tremble when confronted with hell fire for eternity…”judgement”. I assume, from your reply, that you do not believe in literal fire and worms eating at your flesh for eternity. Am I correct? For anyone who does not, I respectfully suggest they read the words of Jesus on this subject. Further reading, for others, of the Old Testament on how God(the same God who saved us) dealt with His enemies should weigh upon our hearts and minds to help us understand the terrible circumstances we find ourselves in, when found on the other side of God’s mercy…His wrath. God’s command to Joshua, when entering the Promised land to wipe out all of the people who resisted him should give warning. David actually tore His enemies apart(quartered), placed them under sharp instruments(cut them to pieces) and had them walk through the brickkiln(burned them up), (1 Chronicles 20:3 ,2 Samuel 12:31) . Nasty stuff to think about… and that is exactly why I apply it, when needed. Some unbelievers are soft of heart and are won through gentle persuasion, but others need to be grabbed, “as snatching them from the fire”(Jude 1:23). The latter are the ones I deal with. Hi Doc. I don’t think my application is wrong. In my opening paragraph I said, “For the ones that are receptive to your faith, you can do some serious seed planting by showing them verses from the Bible to help them make the decision to follow Christ.” This implies that you and I are talking to unbelievers that are interested in what we believe in. That is why I believe they will listen because they are already being drawn by God. Jesus said in John 6:14, “No one can come to me unless the Father who sent Me draws him. And I will raise him up one the last day.” This article was written for those who are seeking already, but maybe don’t know it. Does that make sense? Its always a pleasure to hear from you DocReits. God bless! Thank you for that clarification Derek, and I am good with that idea, although I personally don’t agree, and I hope that is OK with you. I get the reason Calvin came up with that idea, I just don’t believe it is quite right. I have written elsewhere that God’s foreknowledge of who will be saved does not necessarily preclude our Free Will. You write, “No one can come to me unless the Father who sent Me draws him.” But Jesus also said, “And I, if I be lifted up from the earth, will draw all men unto me.”(Jn 12:32) That word “all” is hard to get around. Calvin, of course, says that the “all” refers to simply “all” who are going to be already saved, but I see that as a convenient “work around” to fit his viewpoint(thesis). In the end it is a moot point but does direct our basis of application in evangelism in divergent directions. I believe we need to proclaim the Word in order to wake up the dead, whereas you, IMO, proclaim the Word, in order to lead those already saved, back into the sheepfold. The Holy Spirit, in the end, is the mediator of this action in both interpretations. Is that a fair description? I hope and pray that the free e-book on http://www.HeavenWhoWantsToGoAndHowDoWeGetThere.com will help with spreading the gospel! HI Derek, My friend told me that she lead her friend back to Christ. She’s now going back to church. I wanted to see if you knew the verse about bringing someone who was lost back to Christ..does that start with Blessed is he..? I’ve recently been saved and have a father who continues to claim he’s going to Hell! I have been communicating with my spirit through readings and he wants me to preach to my father since he will not attend church with my mother and myself. He is not a denier of Jesus but has some guilt and Satan blocking his mind. anybody can tell me or give me a direction to help preach the word by giving examples I would appreciate it. See he is 79 has a pace maker and smoking condition. I was diagnosed with Paranoid Shizophrenia 10 years ago. I had to quit my job start social security disability and sat in my bedroom for 5 years before receiving unattended messages to my mind. It was a puzzle I had to figure out and I realized it was the lord Jesus Christ. I begged him for forgiveness etc. it was a very emotional episode. I then a day or so later could feel Satan coming back. It took about a month before I started reading books etc. So I have been given two requests one is to somehow tell my story of my life. A sister very spiritual prayed for me for years also told me she had a dream of introducing me to an audience! She being very active in her church also saved my life during my first suicide attempt when she prayed to Jesus not to let me go! As the dr. was telling my parents that I was gone I came back. I don’t recall this but I told my sisters I was dead! Anyway my 2nd job is to preach to my father now to rid Satans work on his Hell talk and convince him that myself and older brothers difficult life is not his fault. Please email I would appreciate any information. Hello Mr. Davis. First off…praise God you want to save your father from hell. As for your life and your brothers life being difficult because of him, a judge wouldn’t drag your father into court because of the way you were raised if you robbed a store. After we leave home, we are 100% responsible for our own actions. That’s what the Bible teaches. A son shall not be punished for the sins of the father. As for what to preach to your dad, maybe read Romans chapter 1 and 2 and 3. After finishing with Romans chapter 3, ask him what he thinks about it. Does he have any questions. Don’t preach to him….read to him…the power is never in preaching but always in the Word of God itself (Rom 1:16; 1 Cor. 1:18). Hope that helps. Will pray for your dad. Next post: Was Jesus Born On Christmas Day (December 25th)? Should This Matter To Christians?